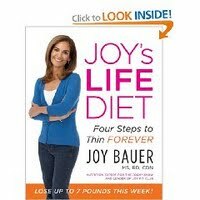 Some of you might remember that back in January I wrote about how I was one of several people featured in Joy Bauer’s new book, “Joy LIFE Diet.” Joy Bauer is a dietician and nutritionist and is regularly featured on the Today Show, especially twice a month when she inducts someone who has lost more than 100 pounds through diet and exercise into her Joy Fit Club. On Monday, I will be the latest inductee. My segment will air during the 10 a.m. hour, called the “Fourth Hour” of the Today Show, but not shown in all markets at 10 a.m. For instance, in Pittsburgh it airs at 2 p.m. and in Minneapolis it airs at 11 a.m. I’m sure it will be on the MSNBC website at some point and I’ll post a link to it when I find it. Anyway, I’m looking forward to the trip to New York. Weather looks nice for a big old walk around Central Park on Sunday and trying not to worry about saying something stupid the next day or forgetting my name. I’ve been on TV before, but man, those butterflies are relentless. For those of you who haven’t seen the Joy Fit Club, the woman in the following video is Tammy, and she’s one of the most awesomely inspiring inductees ever. I don’t know her personally, but she is my hero. She lost 410 pounds and went from needing five liters of oxygen a day to race walking. But that’s not what makes her my hero. As you’ll hear her say, she lost her weight from the inside out. How many times have I said the same thing? It was only until I figured out what was going on inside that I could lose weight and keep it off for good this time. That Tammy and so many of you reading this GET THAT really makes me wish that kind of insight for everyone struggling with weight issues. So…now you know why I’m going to New York. HALLOWEEN UPDATE: Podunkville didn’t get the memo that Halloween is Saturday and so held its trick or treat night last night. This worked out perfectly for me because my daughter came up to stay overnight with the g-babies! 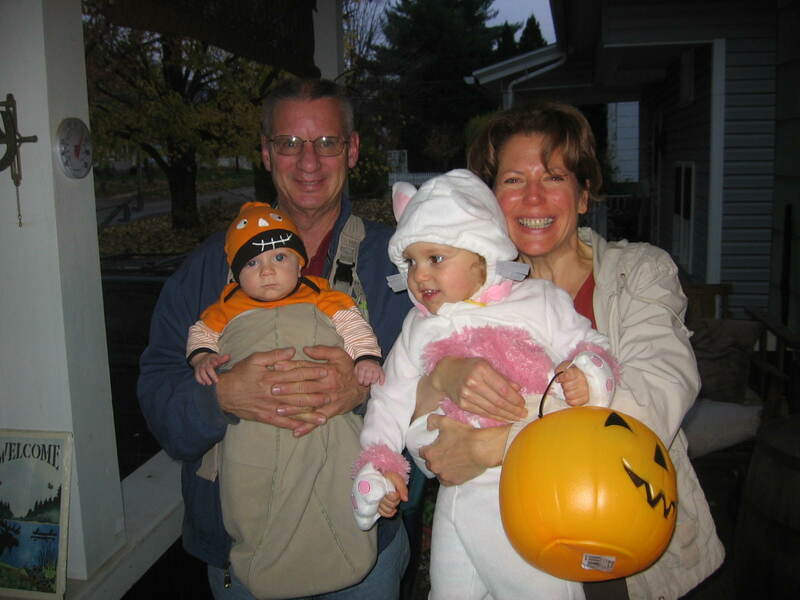 Larry and I took Claire and Luca out around our neighborhood while Cassie handed out candy at our house. Claire was a little skeptical at first. She can’t say “trick or treat!” but once she figured out that all she had to do was show the person who answered the door her plastic pumpkin and they’d put something (she didn’t know what) in it, she was all about walking around the neighborhood, even when it started drizzling. This is Claire eating her first Kit Kat bar. So THAT’S what people were putting in my pumpkin, she’s probably thinking. 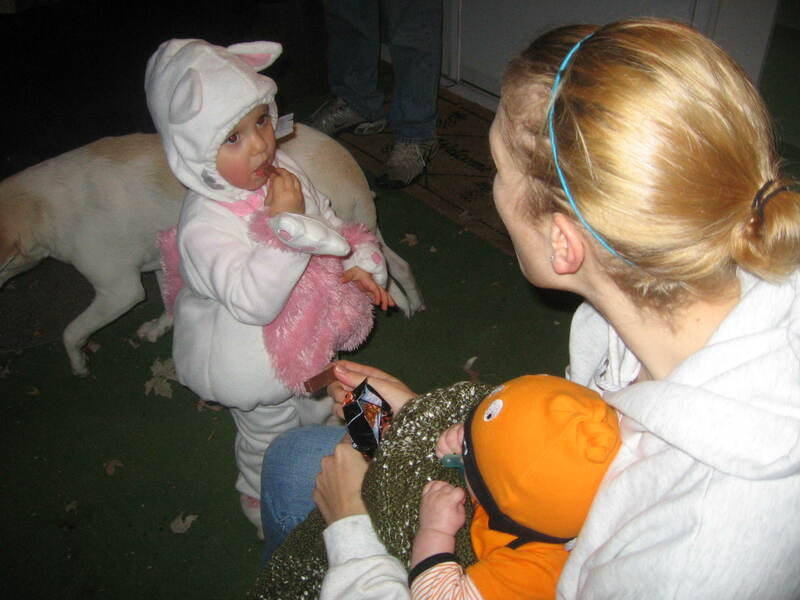 Last night was dress rehearsal for trick or treating in her own neighborhood on Saturday. Larry and I will be there handing out treats so Cassie and Matt can show the kids off. A quick pat on the back for me: Two Halloweens in one year, and not ONE piece of candy will be consumed by yours truly. It helps that I bought Skittles (gag) and Starbursts (I cherish my fillings), and Cassie bought pretzels. But even if I’d bought my favorite candy in the world, I’m pretty sure I would have the courage to say no. Peanut butter Reese’s pumpkins vs. my waistline? My waistline wins hands down, especially if I want to fit into that tight black dress I’ll probably wear on the Today Show. Yikes! Happy Halloween! I’ll be in touch from New York. This entry was posted in Uncategorized on October 29, 2009 by Lynn Haraldson.